New York (TADIAS) — On Friday, July 27th Ethiopia’s PM Abiy Ahmed continued his U.S. tour and met with members of the Ethiopian Diaspora business community as well as individuals representing political organizations in Washington D.C.
PM Abiy is culminating his East Coast visit with a free public address to greet the larger Ethiopian Diaspora in the D.C. metropolitan area later this afternoon at the Walter E. Washington Convention Center. 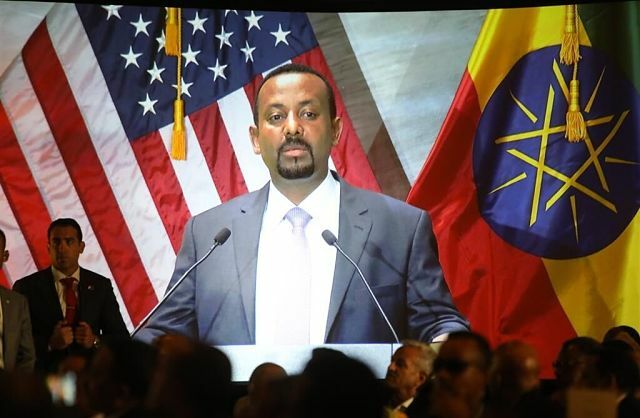 Earlier in the week on Thursday, July 26th PM Abiy Ahmed had taken part in the peace and reconciliation event between the exiled synod of the Ethiopian Orthodox Tewahedo Church and the synod in Ethiopia upon his arrival in Washington DC. The churches were reunited after almost three decades of separation.